Why bake a potato once when you can bake it twice? For years I never understood why people would spend the time to make a potato more than once when a baked potato was perfectly good all on its own. And then I had a twice baked potato filled with creamy cheesy gooeyness and I understood. Because it is completely worth it to take the time to bake the potato twice when the filling is 100 times better. 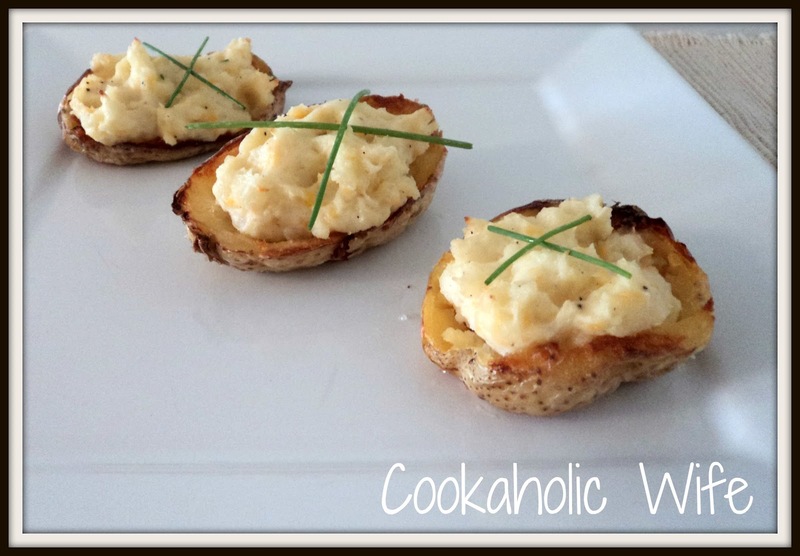 Since trying a twice-baked potato the first time, I’ve had a few varieties of it. One topped with crab dip (OMG DELICIOUS! ), one with chicken, one with a strong garlic flavor and even one with an abundance of fresh herbs mixed in. 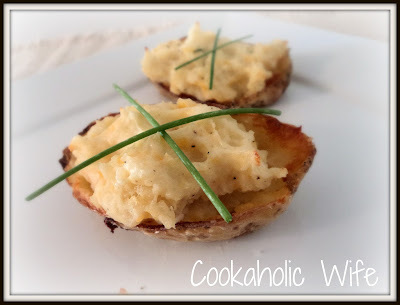 While the crab dip topped one definitely takes the prize of most inventive, it is a bit expensive to make on a regular basis and I’m still pretty partial to just a good ol’ regular twice-baked potato. 1. Scrub the potatoes and prick each with a fork. Wrap each in a paper towel and microwave for 11 minutes. 2. Meanwhile, preheat the oven to 450 and line a baking sheet with foil sprayed with non-stick cooking spray. 3. When the potatoes are done, slice them in half lengthwise and set aside to let cool. Once cool enough to handle, carefully scoop out the potato filling, leaving enough around the skins that the potato won’t fall apart. 4. Place the potato filling in a large bowl and add the sour cream, cheddar cheese, butter and milk. Stir until combined. Add in the chives and season with salt and pepper to taste. 5. Drizzle the potato halves with olive oil. Brush to cover the whole skin and bake for 5 minutes or until lightly crispy. Turn the potato halves over and bake another 5 minutes. 6. Remove from the oven, stuff with the potato mixture and return to the oven for another 5-7 minutes or until lightly browned. Serve hot, garnished with additional fresh chives. Yum! These potatoes are definitely worth the extra work. I served these along side a grilled steak and with sauteed green beans.